Richard, Executive Chef at the Boat Inn Restaurant and Bar at Leaplish Waterside Park, who will provide the dinner, has 25 years experience and trained in two Michelin starred restaurants, The Berkeley and Le Meridien. He said: "Kielder is a spectacular destination, the landscape is so inspiring. The winning couple will be able to enjoy a delicious meal set against the stunning backdrop of this very unique sculpture and Kielder Forest, England’s largest woodland." Elisabeth Rowark, Director of Kielder Water & Forest Park, said: "Our new competition and campaign focuses on the stunning and epic images of the Park which can now be seen on billboards, buses and the metro across the region. "As recent gold award winners in the Visit England Awards for Excellence, we felt we needed to offer everybody the opportunity to view this stunning scenery and invite them to come and discover England’s Best Tourism Experience for themselves. "There is so much to see and do at Kielder - this competition is a novel way to show off just what you can do here. 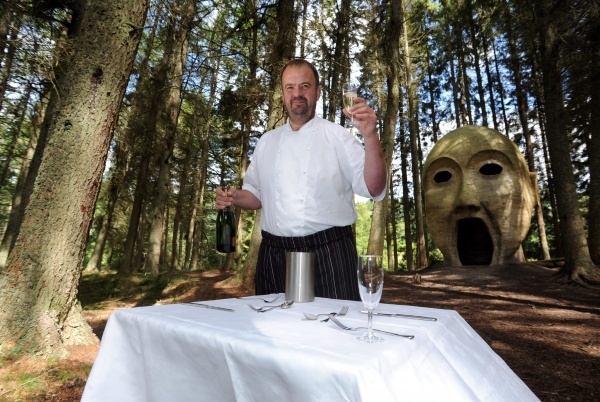 You can’t get a more epic experience than to have dinner and champagne at the Forest Head cooked by a top chef!" The competition ends on Thursday August 8 2013 and winners will be announced on Friday August 9 2013. Entrants simply need to upload a photo of a person (or people) they would want to share an epic experience with and why, on Facebook or Twitter. The ‘epic experiences’ up for grabs include: * Epic Water Experience – an under and over water experience, including speed boat ride, tour of the dam and lunch at the Boat Inn for four people. It was awarded the best Tourism Experience in England by Visit England 2013, and the most tranquil place in England by the Campaign to Protect Rural England. Kielder Water & Forest Park Development Trust is a registered charity working to develop the Park as an inspirational place. It aims to improve economic, social and environmental sustainability, provide public recreation and leisure facilities, facilitate education in all aspects of the natural environment and advance art and architecture in the Park.